With a forecast of 108 (yes, really), I'll be focusing on keeping everyone cool and hydrated today. It is time for icy cold herbal treats, I do believe. This Lavender Lemon Quencher sounds refreshing. Lavender Lemonade is a favorite in our family, too. I think I'll brew up a batch and then freeze it in ice pop molds for an afternoon snack. My iced herb tea of choice is simply to go out early in the morning and pluck a few sprigs of whatever herbs catch my eye- usually lemon balm, lemon verbena, ginger mint, spearmint, and a bit of lavender or rose geranium. Those go into a pitcher of water and sit on my sunny kitchen windowsill to infuse until lunchtime. If I've thought ahead, I will have some pretty herbal ice cubes made with borage blossoms or mint and lemon balm leaves to make my iced tea even more delightful. Sweetened with a bit of honey or agave nectar, this is the perfect summer day drink for me. What summery herbal treats do you brew up this time of year? 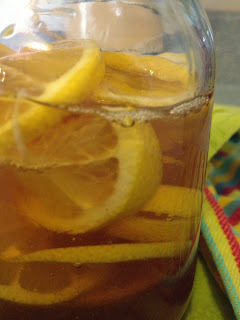 What is your favorite iced tea herb? Please share, I'm always grateful for a new herbal treat to try!